*Assumes a sub-tropical or temperate climate or controlled environment that will permit year-round plant production. That’s a bold claim and one that should be quantified…so here’s the detail. Use of this comparative scale was suggested by Dr. H. Douglas Gross (Professor Emeritus, Crop Science at NCSU – Assistant Director, International Programs). He/we thought that this would be easily ‘appreciated’ by AID bureaucrats. We were wrong in that assumption, but do hope that you will ‘see’ the potential of even small scale Lo-tech iAVs. Context here is Lo-tech, such as for LDC, ‘Third World’ application. Yield from Moderate- to Hi-tech iAVs (e.g., with powered aeration, protection/shelter, CO2 amendment, Etc.) can be from 2 to 3 times greater per unit area/time than indicated here. 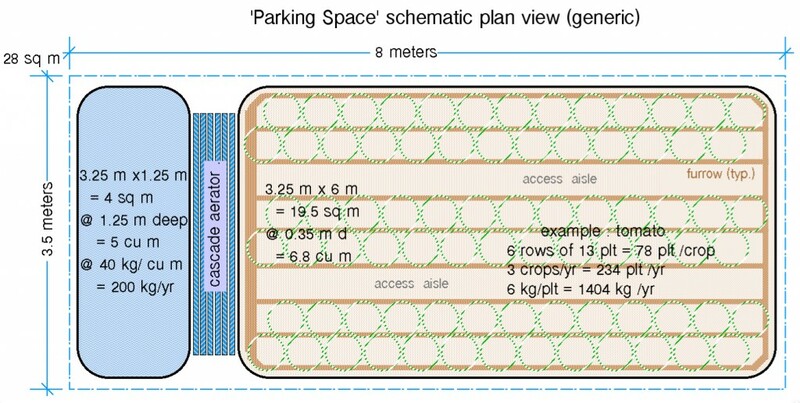 The following is based on an area of 3.5 m x 8 m = 28 m2 , or approximately the size of a typical parking space. Of this area, 18 to 20 square meters is used for the bio-filter/grow bed. Premised on 4 tomato plants per square meter grown as single-stems at 3 crops per year = 234± plants per year. With 234 plants each producing 6 kg of fruit = 1,404 kg yr-1. When growing tomatoes – or a similarly vertical vine crop – for the first month or so when they are small, the grower can simultaneously produce a second short duration crop 3 times/yr. Options include a wide variety of greens and herbs as an intercropped ‘understory’ – and/or other species in various combinations. The fish production is premised on 40 to 50 kg m-3 yr-1depending on feed quality, temperature, DO levels, harvested size, and other factors. The tank would occupy about 4 to 5 square meters with a volume from 4 to 6 cubic meters. Yield of 200 ±50 kg LW Tilapia per year at a typical market size (in much of Africa) of 250 to 300 gram LW each. This harvest size may be achieved in from 100 to 120 days from the 15 g fingerling stage. Harvesting either as batches (cohorts) several times per year or as individuals selected daily/weekly (as desired), or in some combination of household use and cash market sales or barter. If (when) operated without access to electrical power, the remaining area (2 to 5 m2) would be used for a cascade-aeration ‘ladder’ sited between the filter’s outlet and the tank. With electric power, the remaining area may be used to increase the grow bed area and/or tank volume. Please notice that I have not claimed that this is the most practical configuration, but rather that it’s what could be accommodated within a given area. iAVs will produce more food, faster and do so using FAR less water (and energy) than any other method of food production with a comparable capacity.